Don’t ever, in any further or future epistles, address me as old pal. From now on I refuse to be associated with anybody who so consistently ignores some of my most remarkable literary efforts. If you are not going to reply to my letters at least send them back so I can get the bloody credit for collecting some waste paper. anything can be with a bunch of my airmen friends in the immediate vicinity. Thank you for them – provisionally. If the blasted inventors have had a hand in the packing of them you can consider the thanks cancelled. Have they made one of their usual efforts they can now start making their will, as when I arrive time will be too short. Not that it is of any interest to you people but purely as an item of interesting news. I can state that I am fit and well – fit for nothing and well browned off. That I am still healthy will no doubt disappoint many of my friends at Park Royal. For their further discomfort I hope to be visiting in the not too distant future. our stay in this delectable spot is now drawing towards its [sic] hoped for conclusion. Then it is me for the big city, to squander some of my accumulated vitality in riotous dissipation and debauchery. Leaving – I hope – a [deleted] a [/deleted] trail of dirty glasses and dirtier nights. Not being “au fait” with news from Park Royal, I can hardly be expected to know if Mr Hunt has taken my advice and decided to drown his sorrows – or just himself. Either course would make a better man of him. The latest squeeze from the income tax will no doubt have him making friends with Harry Beacham finding out how wangle a few more rebates. any comments on that low life Moloney’s lack of morals. If he doesn’t marry Cherry after spending the Easter together he should be thrown out of the chapel band of hope – the mob that are hoping night work starts again. I often wonder if the overtime book has been stuck in a museum or whether you hold a prayer meeting in front of it every week. In your last – and only letter – you asked how my black passion was going. She has. I had a letter from her and she is by now right near London. Always getting shot down in flames – I feel like a bloody Dornier it happens so often. The next time I get hold of one I’ll take her with me. part the NAAFI is now selling beer. That is recognisable as such. Having always lived dangerously, the brave airmen now drink the stuff and defy all natural laws by refusing to die of poisoning. The next shipment in will not get my patronage until I’ve tried a glassful on the stained walnut furniture. If it bleaches it – it’s safe – if it blisters it – they can give it to the corporals. to all at home. Remember me to she and all. P.S. Tell Moloney not to take any notice of what I write. I got a real one for him when we meet. P.P.S. A certain person writes and says she’d like to see you – in your coffin. 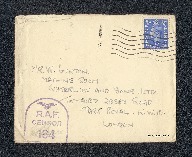 Peter Lamprey, “Letter from Peter Lamprey to W Gunton,” IBCC Digital Archive, accessed April 24, 2019, https://ibccdigitalarchive.lincoln.ac.uk/omeka/collections/document/6637.